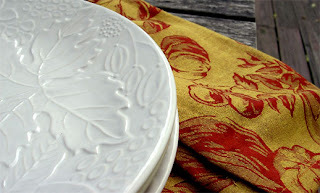 Forever on the lookout for unique and inexpensive additions to the holiday table and kitchen, these inexpensive pieces were found in the dollar-section upon entering Target. The raised texture plates are available for two for $2.50 and come in off-white and olive green. Small salad/dessert plates were also available. The rich gold and burgundy kitchen towels were the same price and could even double as oversized napkins. These warm, oven-baked, chocolate puddings and garnished just for spring. For this recipe and more, visit wwww.andshecookstoo.com. Ready in less than a half-hour, this dish is Moroccan-inspired dish is a combination of sweet and savory. The lamb chops in this dish can be cooked medium-well, which makes them a fast, but still elegant meal. The cous cous in this dish is a flavorful side that can be either heated on the stove or in the microwave. For this recipe and more, visit wwww.andshecookstoo.com. Literally translated, ‘in casserole,’ eggs en cocotte are typically baked in the oven in individual-sized casseroles or ramekins. A light, often delicate, dish that is so easy, full of flavor and great for an easy weeknight supper or Saturday afternoon lunch. For this recipe and more, visit wwww.andshecookstoo.com. We invite you to enjoy our new blog as we expand to bring you more professional cooking tips, methods, and techniques that will enhance your home kitchen and culinary endeavors. Just a few of the ideas we'll be sharing include how to stock your pantry, a return to the basics of sauces and stocks, how to shop for produce when it's in season and much, much more. Soon, you too will be enjoying cheap eats with rich flavors.